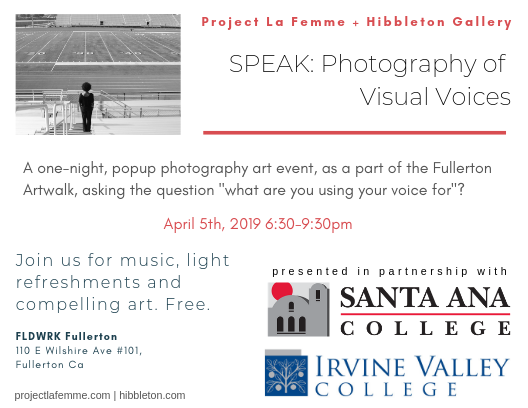 Project La Femme and Hibbleton Gallery are co-hosting a pop-up photography exhibit for Fullerton Artwalk, April 5th 2019 from 6:30pm-9pm at FLDWRK Fullerton (110 E. Wilshire Ave.) in the Chapman Building downtown. In partnership with Santa Ana College and Irvine Valley College Art Departments, this juried art show will feature 30 pieces all in response “how do you use art as your voice?”. 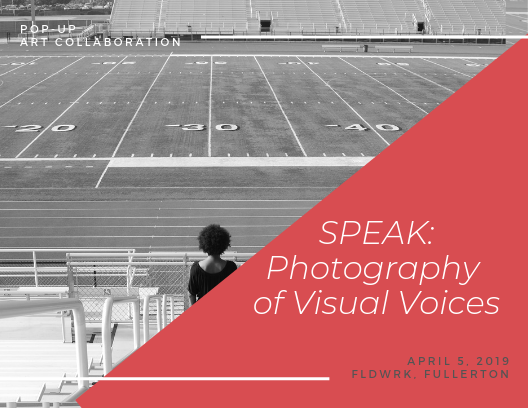 Artists are asked to “speak” on a personal, local, national, or global level issue through their photographs. Music, light refreshments and art. Free.